Striker Robbie Hume marked his Institute debut with a goal. Despite getting off to the perfect start thanks to Robbie Hume's early strike, Institute never kicked on and in the end Lurgan Celtic deserved a point, at a sun-soaked Riverside Stadium. The Waterside men will feel it's two points dropped and boss Paddy McLaughlin will be disappointed his side didn't convert their possession into goals. Institute made five changes to their side which won at Dergview last week with McLaughlin giving debuts to Caoimhin Bonner, Ronan Wilson and Hume, while Mark Scoltock and Gareth Brown also came into the starting line-up. Hume only took four minutes to mark his debut with a goal as he made no mistake firing home 20 yards, after Brown's throw-in found the striker on the edge of the box. Jordan Bell went close for the visitors on 30 minutes but the midfielder's header from close range flew just over Marty Gallagher's crossbar. Just before the break Lurgan were forced into making a change as Philip Donnelly fell awkwardly and had to be replaced by Andrew McAlinden. The visitors should have levelled things on 50 minutes as striker Warren Mullen got in behind the 'Stute defence, but his close range side footed effort was saved by Gallagher. 'Stute thought they had doubled their lead minutes later as Niall Grace's powerful diving header from Aaron Harkin's free-kick flew into the net, but the referee's assistant had his flag up and the goal was ruled out. 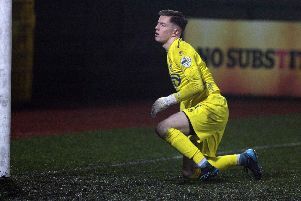 The home side had two good chances in quick succession to add a second but Eamonn Seydak fired just over and Michael McCrudden's tame strike was saved by Celtic keeper Liam McCauley. Just after the hour mark Ryan Morrow, who netted the winner at Dergview, saw his 20 yard drive whistle just past McCauley's right hand post. Celtic drew level on 73 minutes as centre-back Dara Noonan somehow got free inside the 'Stute penalty box and he diverted the ball past keeper Gallagher. Substitute Kyle Friel Curran should have regained the lead for the Drumahoe men, but he blazed over from close range, after the ball fell kindly to him just outside the six yard box. On 85 minutes, Niall Grace's long range strike nearly caught out McCauley, but the Celtic keeper managed to push the effort around the post and Grace headed over Aaron Harkin's resulting corner. Moments later Harkin should have won the game for the home side but his close range shot with his weaker left foot failed to trouble McCauley and flashed wide. Right at the death, Celtic had a good chance to nick all three points, as Bell broke clear down the right, but with only Gallagher to beat, the midfielder blasted well over the bar. Institute: Gallagher, Morrow, Scoltock, Bonner, Seydak; Harkin, Grace, Wilson (Curry 58); Brown (Friel-Curran 65), Hume (Pomeroy 74), McCrudden. Lurgan Celtic: McCauley, McVeigh, Noonan, Rogers, A Rodgers, McAnallen (J Rodgers 65), Bell, Shannon, Donnelly (McAlinden 38), Mullen, Haire.